SAM is professional Internet broadcast DJ software. The most advanced broadcast automation solution that has been developed specifically to fully meet the specialized needs of online broadcasters. Currently features MP3, mp3PRO, Windows Media 9 and Ogg streaming support, dual player decks, advanced playlist rotation logic, drag&drop management, real-time listener statistics, automated requests, web output, multi-server support and much much more! 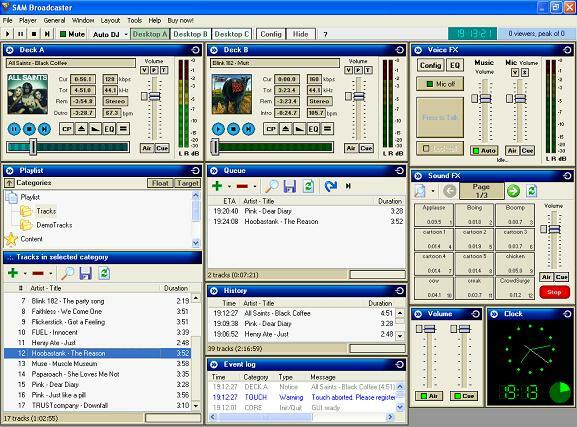 SAM Broadcaster is internet broadcasting radio automation software for DJ. ...... If you are serious about internet radio broadcasting, get your hands on SAM Broadcaster! * Balance all your sound levels. Is a remake of the famous Same game with many addons. Recovery of Windows NT/2000/XP/2003 users' passwords. Qweas is providing links to SAM Broadcaster 4.9.4 as a courtesy, and makes no representations regarding SAM Broadcaster or any other applications or any information related thereto. Any questions, complaints or claims regarding this application SAM Broadcaster 4.9.4 must be directed to the appropriate software vendor. You may click the publisher link of SAM Broadcaster on the top of this page to get more details about the vendor.